We've been making jokes about the current Smart ForTwo for years. Well now we have to think of some new jokes because here is the 2014 ForTwo. Smart didn't make it all that hard. The wee little car, which was leaked on the Geneva Motor Show homepage and caught first by our friends at Road & Track, looks much more sculpted and surfaced before. It also has these adorable little eyelashes in the headlights. It kind of makes the ForTwo look like it had a facelift and is now surprised all of the time. I don't like that. It also kind of reminds me of the super cool Mini Rocketman concept. I do like that. I'm kind of conflicted on the looks, which is something I never thought I'd say in relation to a Smart. 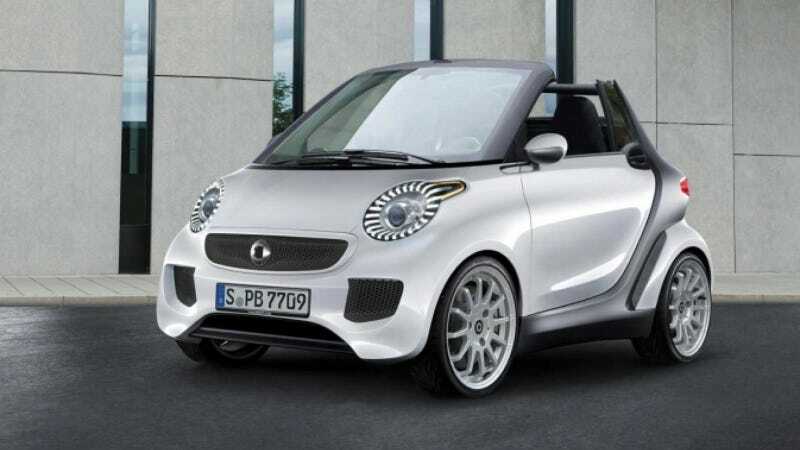 Look for the new ForTwo to debut in full a little closer to the Geneva Motor Show. UPDATE: Looks like this is just a rendering. Some of you are breathing sighs of relief, others are crying. We'll probably still see the real deal at Geneva though.